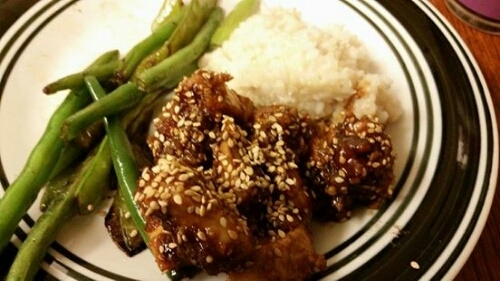 In less exciting and non related news, my husband and I had our good friend over for dinner a few weeks ago and made this baked sesame chicken by Oh Sweet Basil. Originally I was going to make Thai Chicken Soup (which I still need to post on the blog), but after I dumped everything into the slow cooker, I realized that the chicken broth contained an ingredient that our friend can’t eat. So, after a momentary freak out, I whipped up the dish by Oh Sweet Basil, and my husband and I enjoyed the soup on a different night. I must admit, this whole “be flexible” thing is kinda hard, but I’m doing what I can. I did have a few issues with this recipe. I had to substitute flour instead of cornstarch, due to my friend’s food restrictions, and it just was a big clump. When I mixed it into the saucepan, it just stayed clumpy, no matter how hard I whisked it, so I ended up just spooning out the flour clumps. I’m sure it would be better with cornstarch. Also – please only use low sodium soy sauce! The original blogger specifies to not use regular soy sauce. I only have regular soy sauce (thanks to buying in bulk at Costco), so I combined 3 parts soy sauce and 1 part water (my mom has always sworn that low-sodium soy sauce is just watered down), and that worked out really well. Even so, it was almost to the border of “too salty.” I know I’m infamous for being a salt-hater, but even my salt-loving husband said that any more salt would have been unpleasant. I guess the blogger really knew what she was talking about! -Spray a cookie sheet with nonstick cooking spray and set aside. Season the chicken with a little salt and pepper and then dredge in the panko bread crumbs until they are evenly coated. Place on the baking sheet, drizzle with a little oil and bake for 20 to 30 minutes or until cooked through. 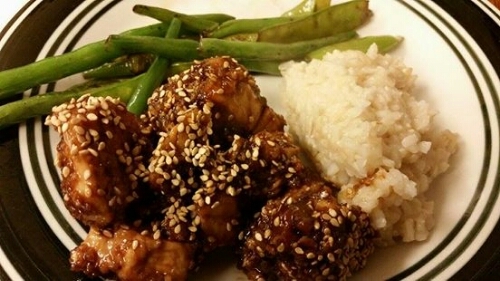 -Meanwhile, in a sauce pan over medium heat, add the sesame oil, ginger, chili paste, and pepper flakes and stir for a few seconds then quickly add the stock, soy sauce, honey, vinegar and brown sugar. Let it come to a boil while stirring frequently. In a small dish, whisk together the cornstarch and water. Once the saucepan mixture is boiling, slowly add the cornstarch mixture, stirring until thickened. Once thick, pour over chicken and top with sesame seeds. Serve immediately.